Pharyngitis is an inflammation (acute and chronic) of the mucous membrane of the pharynx. Strep throat is seldom isolated; often occurs as a top-down catarrh of nose or throat (rhinopharyngitis, the common cold). In the etiology of acute pharyngitis significant role belongs to the adenoviruses (see Adenovirus infections). Clinical picture: the mucous membrane of the pharynx red, sometimes it mucopurulent raids, sometimes perform as grains individual follicles, tongue reddened, swollen (Fig. 1). Body temperature may be low grade. Subjectively felt the dryness in the throat, mild pain when swallowing, especially when the "empty his throat." Treatment is mainly local, same as in catarrhal angina (see). Chronic pharyngitis: catarrhal, hypertrophic, atrophic. In occurrence of chronic pharyngitis have the value of local factors (rhinitis, sinusitis, tonsillitis), household (Smoking, excessive alcohol), professional (industrial dust, harmful gases). Subjectively patients with chronic pharyngitis experience dryness in the throat, feeling scratching, sometimes pain when swallowing, the need for frequent expectoration of sputum. In catarrhal pharyngitis (Fig. 2) the mucosa of the pharynx moderately thickened, visible dilated veins, often enlarged follicles. When hypertrophic pharyngitis (Fig. 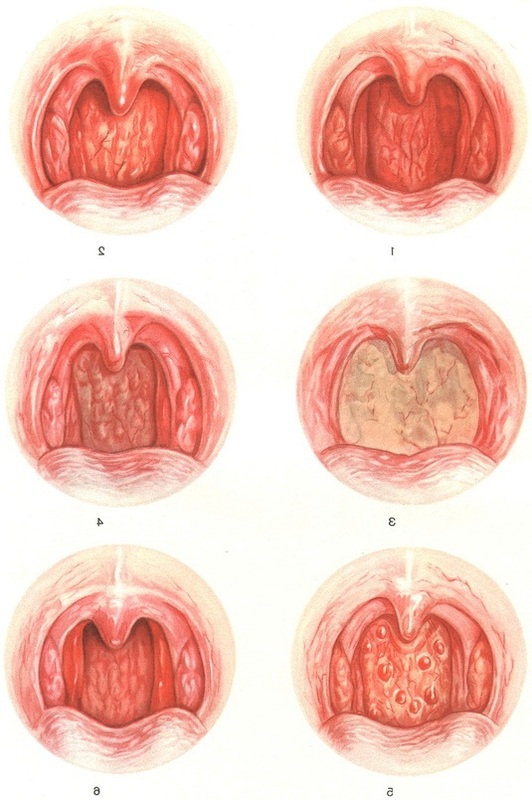 4-6), the mucous membrane of the throat thickened, covered enlarged follicles side bolsters of the pharynx increased, on the mucous membrane of accumulation of mucus. In atrophic pharyngitis (Fig. 3) the mucous membrane of the throat is dry, shiny, as if covered with a varnish. Treatment: removal of local reasons (rhinitis, sinusitis, tonsillitis), alkaline flushing, lubrication mucosa 1-5% solution of nitrate of silver (lapis), glycerin solution of iodine with simultaneous alkaline rinse. Pharyngitis, accompanied by painful sensations of pain, it is recommended novocaine blockade. Fig. 1. Acute pharyngitis. Fig. 2. Chronic catarrhal pharyngitis. Fig. 3. Chronic atrophic pharyngitis. Fig. 4. Chronic hypertrophic pharyngitis. Fig. 5. Chronic granular pharyngitis. Fig. 6. Chronic side pharyngitis.